Those of you building your very own 3D printer or have already built one looking to upgrade the extruder might be interested in a new piece of hardware which has been developed by Zesty Technology. 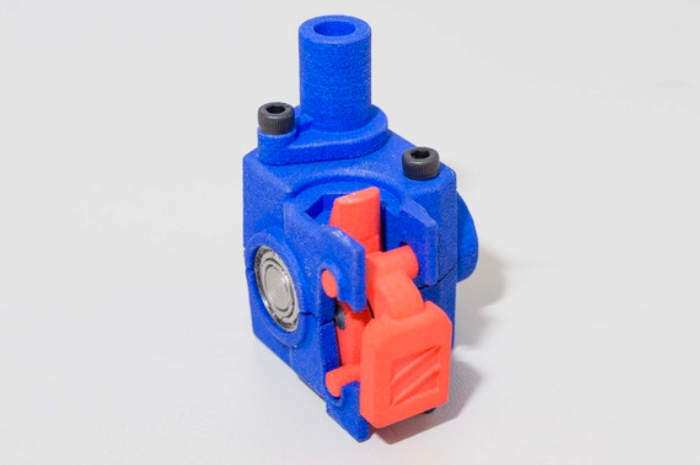 The Zesty Nimble extruder has been designed to provide a lightweight super fast extruder that the developers claim is 50 percent lighter than the Titan extruder. What she demonstration video below to learn more about the Nimble and its features. The Zesty Nimble is a very lightweight extruder that allows direct drive across a plethora of printers and hot-ends while bringing flexible filament capabilities to all 3D printer owners. It will fit on most 3D Printers and is an extremely flexible system with adapters for any situation. A lot of printers, especially Delta type printers, have a problem with printing flexible materials as they have a long bowden cable. With the Zesty Nimble you can remove the bowden cable and print flexibles, any other filament and often print faster as well. What is in it for you? Flexible filaments are now easy to use. Clear view of the whole filament path. Will fit any printer, just mount with 2 M3 screws. Faster printing with more accuracy, less stress on the printer. Just flip it over for optimal placement. With our adapter system it will fit any type of hot end. Adding an extra hot end? Even with a Chimera you simply order a secondary Nimble. Injection molded making sure the parts are accurate and strong. Our gear system increases available torque. Smaller and lighter than any available extruder, with the added benefits of being more flexible and easier to use.